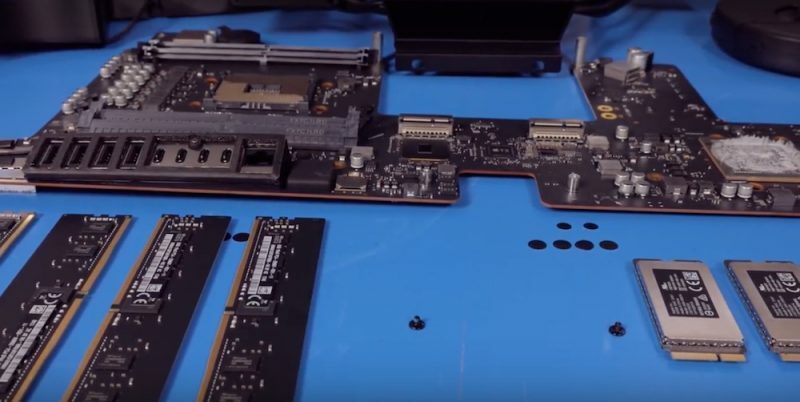 While we await iFixit's inevitable comprehensive teardown of Apple's new iMac Pro, third party Mac component supplier OWC has just published its own teardown video, providing some interesting tidbits on the internal configuration of the non-user upgradeable machine. Whereas standard 27-inch iMacs have a small hatch in the back that allows the RAM in the machine to be upgraded after purchase, the iMac Pro does not. Fortunately, an Apple Store or an Apple Authorized Service Provider is able to open up the iMac Pro and swap out the RAM, and here's what they can expect to find upon doing so. The teardown reveals that in the 32GB base model, there are four 8GB DIMM modules, a configuration type that appears to be mirrored in the 64GB (4 x 16GB) and 128GB (4 x 32GB) models. The good news is that this means the iMac Pro supports quad-channel memory, but the bad news is that it also means users looking to upgrade from, say, 32GB to 64GB will have to replace all four modules to do so. The teardown also reveals that in the iMac Pro 1TB base model, Apple has chosen to use two 512GB SSDs in a RAID configuration. Rather than soldering the flash storage on the main board, both drives exist as separate modules that are attached via screws, so replacing them is at least technically feasible, even if Apple does not make it easy. OWC says that in the near future it will be offering a DIY memory upgrade kit for the iMac Pro, although most users are likely to hand over such an undertaking to a qualified service provider. For more details on the iMac Pro's internals, including the Intel Xeon W eight-core processor, be sure to watch the video embedded above. Yep RAID 0 sounds way too dangerous. I understand that they wouldn’t be able to reach the 3GB/s speeds but I could settle with half of that speed if that meant a single SSD. Again, SSDs internally are essentially RAID0! Read the above posts. But they're probably using APFS "RAID" instead of actual RAID. No they are not. There is a single Apple SSD device seen by the OS. I believe they are using the T2 as the RAID controller. I have one and I’ve looked at “diskutil list” as well as “ioreg” output in detail. The 1TB option appears as a single drive to the lower layers of the OS. RAID 0 with two drives doubles your chances of a complete volume failure. I would never want all my data (or even worse, a "Pro's" data) sitting on a RAID 0 volume. It seems it wouldn't take more than a little "glitch" to render your drives useless. Sure, but thats how SSDs have worked in a while now. You have multiple chips that are written in parallel by the controller. Thats also why larger capacity SSDs are usually faster. The reliability is barely an issue here, while added performance is always welcome. Anyway, you are supposed to do backups onto redundant storage anyway, no matter what kind of main storage you run. Wow. Some people here make me really lose faith in the human race. • Do you seriously believe Apple is building RAID0 into this thing to try to cut costs??? Good grief. I’ve been asking Apple to build machines with multiple striped drives - for the performance gains - for years. I’m so glad they’re finally doing it and why the hell they haven’t done it before now is beyond me. The performance gains far far outweigh the chance of lost data. Going on about RAID 0 doubling the chance of failure is idiotic at best. The chances are so low with today’s SSDs that doubling that figure is still so insignificantly small it’s meaningless. There are any number of ways your data could get hosed. The chances of you accidentally burning your office down are far higher than the chances of your internal SSD failing. Just back up your data for goodness sake. With 3GB/s instead of 1.5, you’ll restore it all in half the time! Please stop trying to persuade Apple not to double the performance of internal storage for the rest of us because of your misplaced paranoia. • Compaining about this thing not being upgradeable is equally idiotic. This machine is designed for a pretty specific market and for that market it’s perfect. They will lease tha machine with AppleCare for three years then they will write it off and get a new one. Some may buy it and then when they want to upgrade they will sell it (these things hold their value very well) and then buy the next one. Believe it or not that’s how some of us prefer to work. This machine is perfect for those two markets. If that’s not you, fine, don’t buy it and wait for the modular one they’re promising. I agree with you that they shouldn’t have stopped making modular pro machines. But they’ve heard you and they’re doing it. Trying to say this machine shouldn’t exist and the modular approach is the ONLY approach pros want is so unbelievably short sighted. • And complaining about the price... again, you don’t get it. Firstly price comparisons have been done and for what’s in this thing the price is very reasonable (in some cases less) compared to DIY builds with the same parts or other companies’ offerings. Again, this machine is designed for a certain market - the kind of people doing work where every second they’re sitting around waiting for their hardware to render or calculate something costs big money. This thing will pay for itself and then some in a matter of days. The performance in this thing (and hopefully in the modular one that’s coming which will also be expensive) is worth every darn cent to those people and they wouldn’t have it any other way. They WANT a machine that spares no expense in saving them time. If you’re doing that kind of work then you get it, and these expensive pro machines are for you. If you’re not doing that kind of work then this machine is not for you. Go buy the standard iMac for half the price and you won’t notice the slightest difference. But please don’t get in the way of those of us who do need this kind of performance and are willing to pay fair market price for what it actually is. Yes I’m aware of that. That’s exactly what I said on my post as well. Just in case you’re not aware RAID0 means that if something goes wrong with one drive you lose both drives. You seem to contradict yourself. If you know that any high-performance SSD is using stripe storage, whats the problem? And sure, if one of the storage chips go, you loose the entire package. Despite all this, the SSDs were proven to be rather reliable. There is nothing new that Apple is doing here, its how it worked for years now, they are just switching more of the chips in parallel. Twice of a very low chance is still a very low chance. And in case of a unlikely failure, you have your backups. So nothing really changes from the practical perspective. Yeah, RAID 0 with spinning disks doubles the chance of volume loss because a RAID 0 volume with spinning disks cannot work at all if one of the disks dies. However, the failure mode of an SSD is completely different and it is much much less likely that the entire SSD module will fail. Therefore, partial data loss is the more likely scenario and the likelihood of that happening scales linearly with SSD size regardless of the modules themselves being striped. Newsflash - they ARE building a new Mac Pro. There is room in the product line for both the iMac Pro and a Mac Pro. bear in mind that every SSD works internally with a similar technology like RAID 0 does. Have you completely missed the fact that the CPU is not soldered in and could potentially be upgraded too? And what would the point of that be? If you need the 18-core CPU, get it from Apple now. Even if you can find the W-2195 in retail (which is far from being a certain thing), its still going to cost you at least $2500, maybe more. And you most likely won't be able to upgrade to a future gen CPU, since it's going to be a different socket. The only situation where I see a CPU upgrade useful is if you dramatically misjudged your needs and ordered a config thats not up to the task. Its going to be a rather costly mistake in any case. Those formerly top end Xeon sell for a pittance. In for or five years when the iMac Pro is starting to show it's age. You could bump it up to the 18 core for $100 to $200. Getting a few more years out of it. There is a market for the person you're talking about but it's an enthusiast not a "pro" and they never generally liked buying Macs if they were up for changing CPU's anyway. Hell i've ripped multiple 27" iMacs completely apart and even I wouldn't want to muck around changing the CPU no matter how much money it saved me.